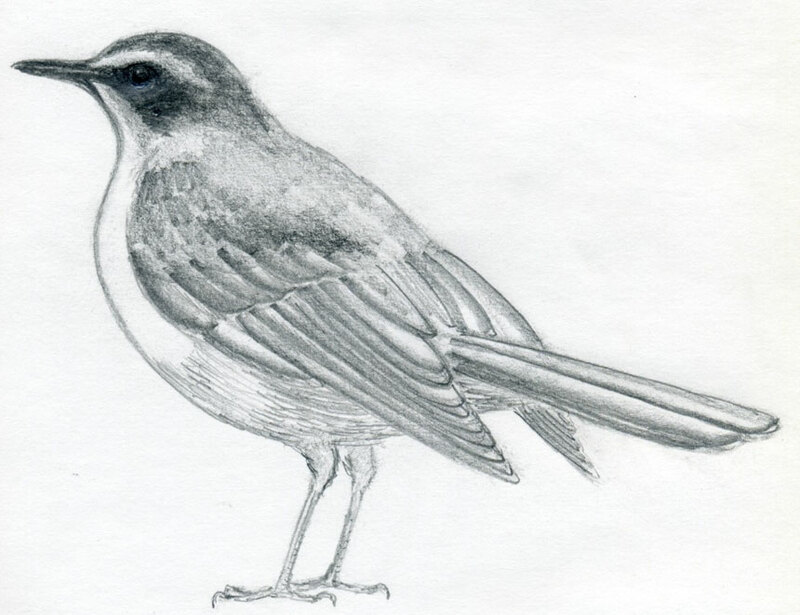 To learn some simple bird drawings is in fact very easy and I’ll show you here how to do it. Once you know the basics - the “recipe” - it may surprise you how simple it is. On the other hand an entirely different thing is if you attempt to draw a real bird or to make a real bird drawing from photo, which you want to draw realistic. There you simply should be as exact as possible and capture every important feature. But I can assure you, that even such seemingly “difficult” drawing is in fact simple, because the process of drawing is exactly the same as for any other object. 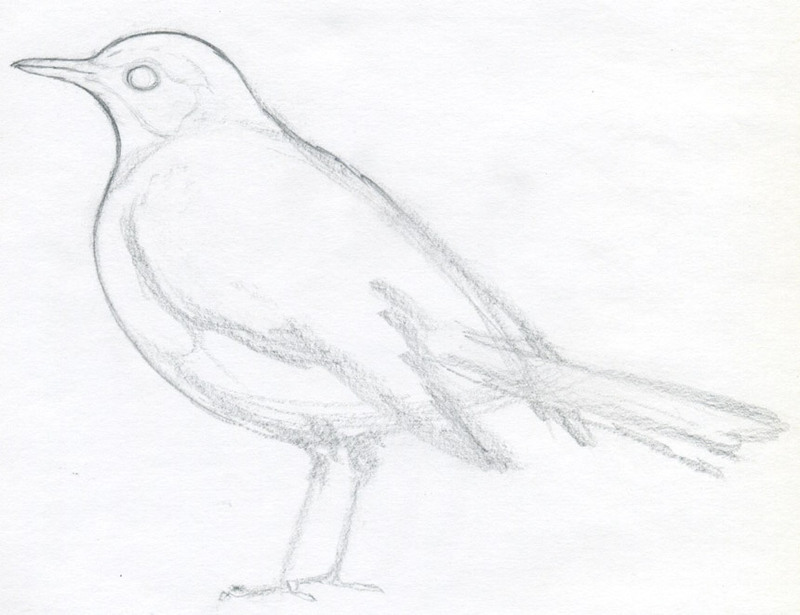 I show you first how to draw a bird – in general, simple approach. Here you’ll quickly master the fundamentals of bird’s body. 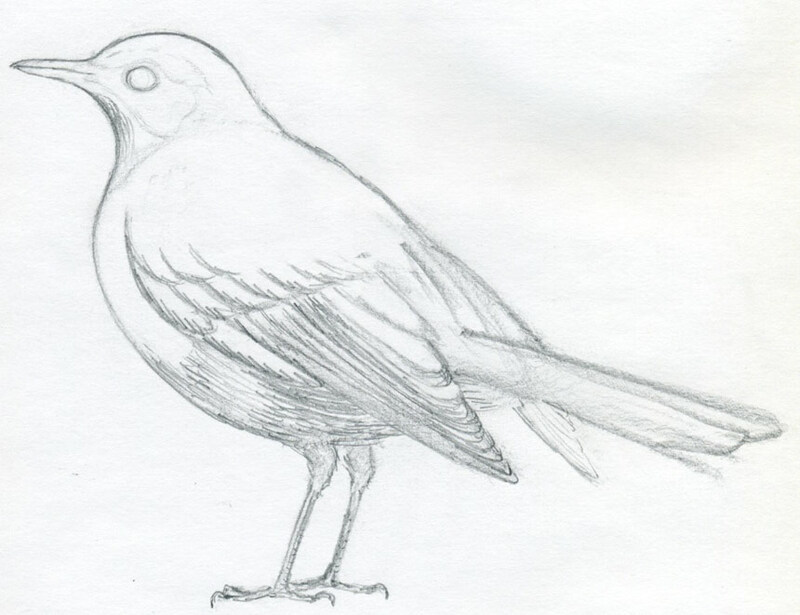 Before drawing an outline, try to observe the bird’s body proportions on the picture above. the beak is directed slightly upward. same time intensely observing the proportions of both; head and trunk. Nevertheless, it is very difficult to say which way is the correct one to start with. It is individual and it also depends on your drawing skill level. I would say, also try to use your intuition a little, because drawing is a creative activity and you often cannot make it simply by following a prescribed manual. Every bird has different body proportions. For instance, kingfisher, that small tiny cute creature has the beak almost the same size as its body. In such case you should pay special attention to the size and shape of the beak because it is one of the main features on your bird drawing. Generally, a bird’s trunk is almost always a teardrop-shaped fuselage. When you draw a bird always keep in mind that bird, in fact, is a small living airplane. As always, use tilted pencil, loose grip and your lines will be much stable and exact. Now you can join the head circle and the body fuselage together by gentle curves that will create the bird’s neck. At this stage, the drawing – sketching, is still very rough so make as many pencil lines as necessary. 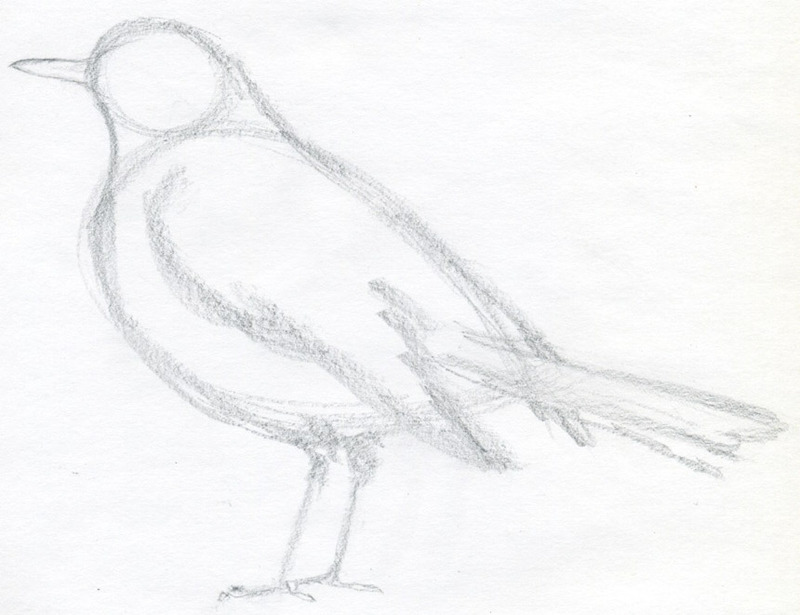 Add the tail, mark out the wigs – just approximately, outline the beak and draw the legs. While drawing and sketching these basic body parts, always keep your eye on the good balance and proportions of the entire drawing. 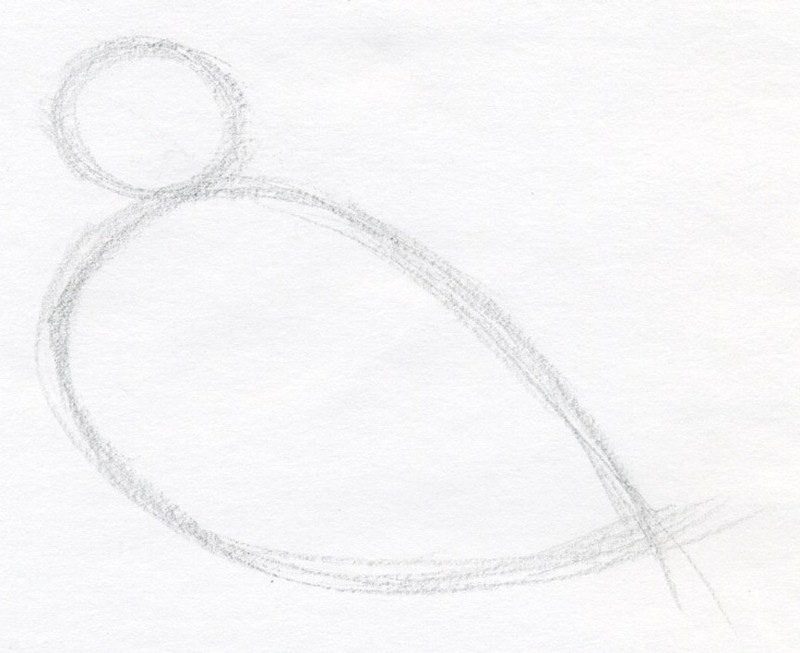 At this stage you have a basic body outline of a bird. You can erase the excess pencil lines and slowly get closer to the real shape. If possible start from the head, which naturally leads you to draw the beak. Observe once more the ready bird drawing on the top and pay special attention to the position of the eye. Note, that the eye is closer to the beak, so outline the eye first only by a weak pencil line, very gently. Bird’s tail serves as a supporter when sitting and it often moves up and down depending on the bird’s position. The tail consists of several long feathers assembled into a fan-like shape and it actually looks like feathers piled up on each other. Erase the rest of all unnecessary initial pencil lines and you have a beautiful picture to add to your collection of bird drawings.